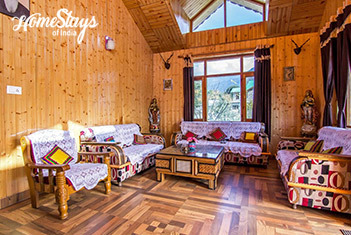 Surrounded by the Pir Panjal and Dhauladhar ranges in the lush green valley with Beas River as the life line, Manali is a year-round magnet of Himachal Pradesh. 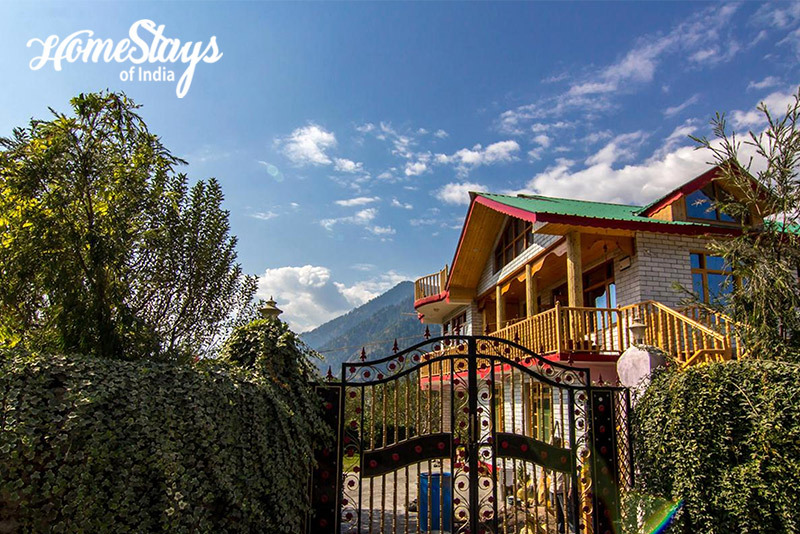 Families and honeymooners come to experience snow, adventurers come for trekking, climbing and rafting and backpackers come to hang out in the hippie villages around the main town. It is always a good idea to unwind here for a few days in the fresh mountain air. Situated at 6724 ft Manali is also important for being the gateway to Lahaul-Spiti and Ladakh. 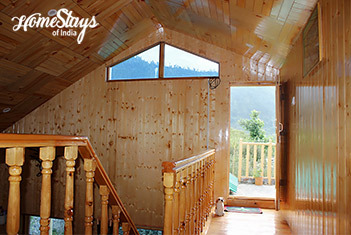 Not just a homestay, it’s a traditionally built cottage style home nestled in the lap of nature. 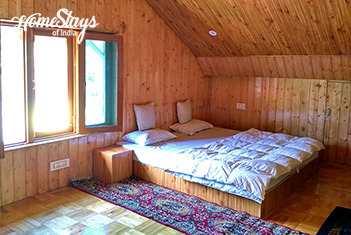 It is conveniently located 7 km from Naggar and 13 km from the Mall Road, Manali. Far away from pollution and chaos, it is nestled in an apple orchard. There are Peach, Plum, and Apricot trees for fruit lovers. There is a 4 bedded family suite (2 inter connected bedrooms) which has a private entry. 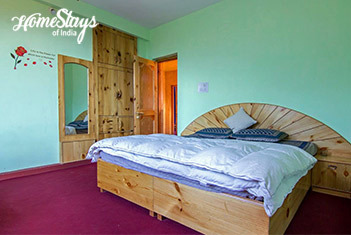 2 wooden cottages are on the top floor, 2 well furnished rooms on the first floor with wall to wall carpet. Every room comes with attached toilet and running hot water. There is separate pantry for Tea/Coffee making, and a garden to enjoy it. Food is served in the dining hall but if you like you can join the family to enjoy local food. There is a tent pitched in the orchard for adventure lovers. Best part is, it is located 1.2 km off the highway to give you ultimate peace & privacy and your car drives to the doorstep. Come with family, friends or solo, you will love it..! Chhabil Singh and his family are resident of Rangri for centuries. Every nook and corner of kullu-Manali is so well known to them. He is a teacher, a simple man who loves to talk about nature, fruits and gardening. He also is a good guide and cook who along with his family takes care of the home and the guests. Freshly cooked, local cuisine and North Indian vegetarian food only is served. Non-vegetarian food is not allowed. Most of the vegetables supplied to the kitchen come from our own organic farm. Breakfast is served as per your choice like Paratha with curd or tea and local pickle, Sandwich, Butter Toast, Jam Toast,Bread, Oats, Cornflakes, Muesli, Siddu or Puri Bhaji. You would love Herbal Tea, Butter salt tea and Pakodas in the evening. We have a small dairy farm of our own, so you get milk and other dairy product fresh always. Since we are located in a fruit orchard, you are free to choose, pluck and enjoy yourself. Jogni Water fall, Mall Road, Hadimba Temple, Monasteries , Van Vihar, Wild life sanctuary, Sajla Water fall, Soyal village, Heritage Viilage Nagar,Jana water fall, Hamta Pass. I have stayed here twice, once with friends and once as a solo traveller. This place has never disappointed me.. Its like a home away from home for me. 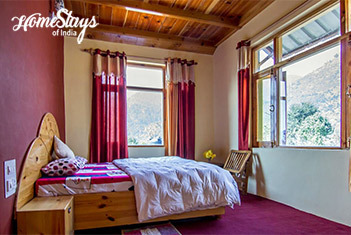 Its located in Hallan village, some 13kms before Manali. The location is perfect for a peaceful, rejuvenating vacation. 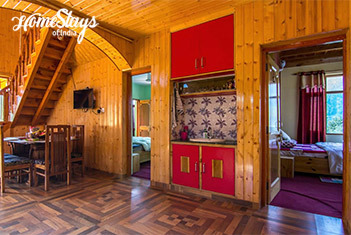 The interiors of the house is done in wood and rooms are cozy and comfortable. Valley view from the balcony is something I loved to the core. Family is very welcoming and doesn’t makes one feels like a stranger. Food served here is fresh and tasty. The only draw back is if you are travelling by public transport then its away from the highway. But they arrange tranfers if requested. I highly recommend this place to everyone who is looking forward to have a true himachali hospitality.